There are opportunities on Sunday and during the week for learning more about God, about our Savior, and about our Christian life. 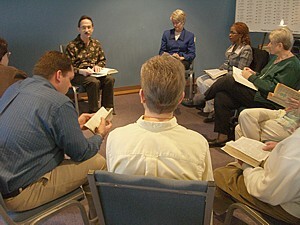 A number of the adults of the parish meet on Sundays during the program year, from 8:30 a.m. until 9:00 a.m., to discuss either a book of the Bible or a book chosen by the class members. Individual perspective is combined with traditional teaching and scholarship to make for a lively and enlightening study experience. Recent discussion topics have included the Acts of the Apostles and the Gospel of Luke, plus various of the letters of Paul. The class is currently discussing the Book of Daniel. Rev. Renee offers a bible study, Gospel Musings, which explores the gospel passage for the upcoming Sunday. This gathering meets on Thursday mornings at 10:00 a.m. Everyone is welcome to bring their favorite version of the Bible.